Yesterday was D23's panel for "Pixar and Walt Disney Animation Studios: The Upcoming Films". 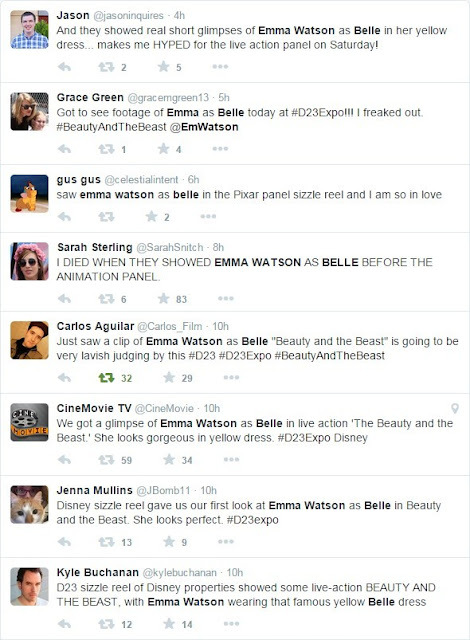 They showed a footage of Emma in "Beauty and the Beast" but no videos or pictures were allowed. 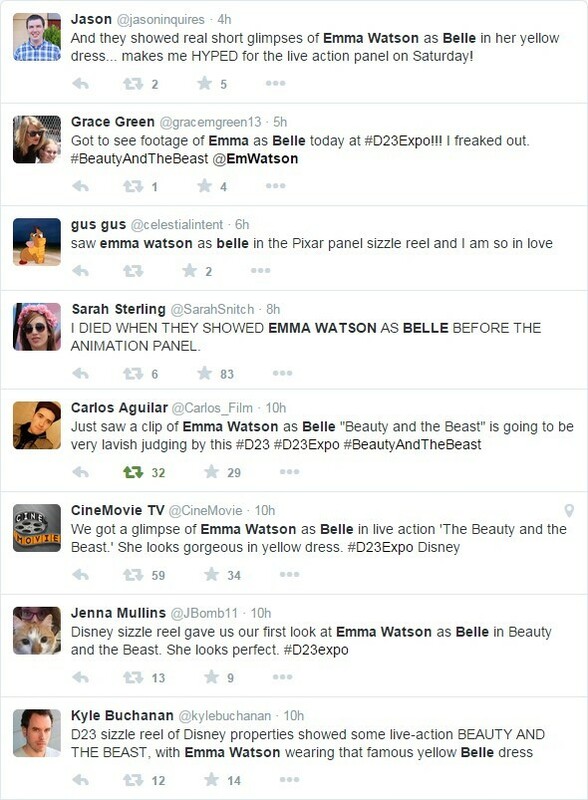 Some people took to Twitter to share their (only positive for now) opinions about it. One even made a full description of it. It’s dark and blue (reminded me a lot of “Into the Woods”) and you can see snow on the ground. Belle is in a cloak so we can’t see what her outfit is. I’m 95% sure that the cloak is navy blue but with how blue the shot was I can’t be 100% sure. She looks FREAKED OUT but not hysterical. Quick shot of Belle stepping down the stairs. Staircase is gold and whimsical, very similar to Cinderella’s carriage from the latest “Cinderella” movie. The yellow dress is more of a sheer fabric than the heavy material in the cartoon version. The skirt is less full. Still stunning. Top looks similar to “Once Upon A Time” Belle’s yellow dress but not as poofy. 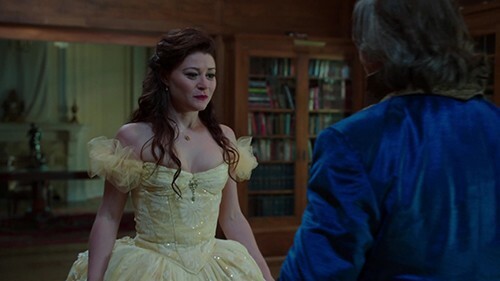 Last shot is Belle in the yellow dress looking up at (I’m assuming) the Beast. She looks like she’s kneeling or in a deep curtsy. Today, will be the panel for "Worlds, Galaxies, and Universes: Live Action at Walt Disney Studios". More could be revealed.